Why Did The Yankees Finish 13.5 Games Behind The A's In 1931? The A's were 107-45 for a .704 pct while the Yankees were 94-59 for a .614 pct. The A's outscored their opponents 858-626 (good for a 97-55 Pythagorean W-L record) while the Yankees outscored their opponents 1067-760 (good for a 100-53 Pythagorean W-L record). All data comes from Retrosheet and Baseball Reference. The A's were 19-14 in 1run games while the Yankees were 19-20. The Yankees were 44-9 in games decided by 5+ runs, a .830 pct. The A's were 31-14 in games decided by 5+ runs, a .689 pct. So it looks like the A's were not especially great in close games or in lopsided games, while the Yanks did poorly in close games and great in lopsided games. 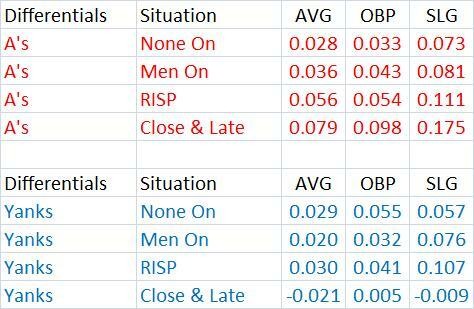 The A's and Yankees were also about even in their differentials in AVG, OBP and SLG. The following table shows this. The A's had a batting average differential that was just .001 better. 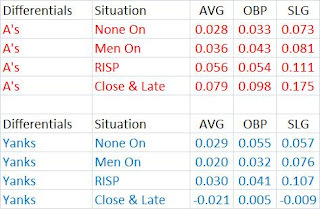 They were slightly better in SLG differential but that is offset by the Yankees having a better OBP differential. It seems like they should have had very similar records. Maybe it was something else. Maybe the A's had better baserunning or reached on errors (ROE) alot more than their opponents. No, that is not the case, either, as the next table shows (the little i means Retrosheet does not have complete data on something). Neither team had an especially big advantage in ROE or GDP, based on what is available. But the Yankees seemed to do alot better in stealing. The SB and CS for their opponents is about the same for both the Yankees and A's. But the Yankees stole alot more bases with a much better pct. So there is still no statistical smoking gun. But the A's came through in the clutch alot more as the next couple of tables will show. RISP means withe runners in scoring position (Retrosheet notes that they don't have complete numbers on these splits). It may be hard to take all that in, so the next table shows the differential for each team. But notice how well the A's hit with men on, with RISP and when it was Close & Late. Just incredible. The Yankees did not hit especially well when it was Close & Late. The advantages the A's have when it was Close & Late are just astounding. They outslugged their opponents by .175. The Yankees, meanwhile, seemed, at best, to break even with their opponents when it was Close & Late. Maybe this is the key to the 13.5 game margin. The Yankees and A's split their 22 games at 11 wins each. But the Yanks outscored them 124-97, which should have given them 13.6 wins or a .620 pct. The A's won 7 games by 1 or 2 runs while the Yanks won 4. The Yanks won 3 games by margins of 11, 12 and 12 runs while the A's won only one game by 10 + runs (12). At the end of August, the Yankees were 17.5 games behind (actually in 3rd place-the Senators were in 2nd, 15.5 games out). They had a Pythagorean W-L pct. of 0.625. The A's had about .670. The Yankees would have been about 5 games out, still with a chance to win the pennant. But they only had 3 more games left against the A's. The Yankees actually went 21-6 after Aug. 31, outscoring their opponents 198-87. The A's were just 17-10, outscoring their opponents 137-120. They really had no need to try very hard that last month. So some of the mystery is solved with the September performance. But still, going into that month, the Yankees should not have been that far behind. The A's performance in the clutch is what gave them the big edge. This is probably due to luck. Update Jan. 2: Although the A's had a better Pythagorean W-L pct. through August, it is still possible that the Yankees "out played" them. 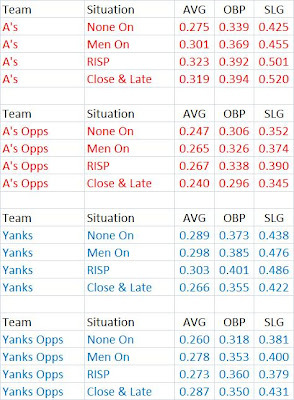 I don't have the OPS differential for each team through August, but I can show something similar based on each team's HRs, nonHRs and BBs and what they allowed in those stats. Now those are all differentials. If you plug in the values for the A's, you get .599. So they were a very good team through Aug. But the Yankees were better, at .613. So even before Sept, when the A's were able to coast, they still must have been timing things better than the Yankees, being 17.5 games ahead of them. Again, I wish I had the OPS differential for the pre-Sept games. One problem with this lastest analysis is that it does not take into account what the nonHR hits were. It turns out the A's hit more 1Bs, 2Bs and 3Bs than their opponents while the Yankees just had more 1Bs. The Yankees actually had fewer 2Bs and fewer 3Bs. So I assumed that the breakdown each team had for 1Bs, 2Bs and 3Bs as a percentage of all nonHRs was the same pre-Sept as it was for the whole season (this was done for those hits allowed, too). 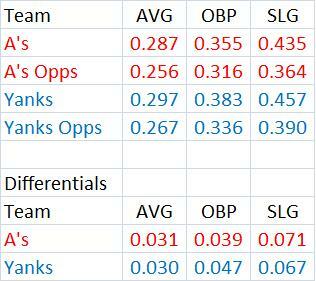 Then I found each team's differential for 1Bs, 2Bs and 3Bs as well as HRs and BBs, but for pre-Sept. only. Then I calculated the linear weights value of those differentials. I had the A's being 177 runs better than their opponents while the Yankees were about 150 runs better. So that makes the A's a better team pre-Sept. But those 27 runs are worth only about 2.7 wins. It should have been a close pennant race up to that time. So, again, it was pretty lucky for the A's that they had such great timing in getting or preventing hits. This is a family blog, so I have to say heck. After checking data at Baseball Reference, 1974 looks like the first year that none of the top 3 vote getters in either league were among the top 10 in WAR. I did not find this happening in any year before, even if in only one league (if I missed one, let me know). At least one of the top 3 vote getters was in the top 10 of position players or pitchers in all previous years. Now this is not a systematic analysis. Maybe other years were worse in terms of how well WAR was correlated with the points each guy got. There were some cases of a winner tying for 10th (Boyer, Campanella). Konstanty was 7th among pitchers in 1950, but not in the overall top 10 (which combined pitchers and position players). Now Frisch and Cochane were also managers. Maybe that influenced the voters. In 1974, Reggie Jackson, Gene Tenace and Bert Campaneris all had more WAR than teammates Rudi & Bando. In the NL, Garvey led his team in RBIs and batted over .300. His teammate, Jimmy Wynn, beat him in WAR, 7.6 to 4.3. But Garvey beat him in AVG (.312-.271) and RBIs (111-108). Brock set the then SB record with 118. Maury Wills won the award in 1962 when he set a record with 104, so I guess the voters thought Brock had to get some consideration. But Garvey's Dodgers won their division while Brock's Cardinals did not. Mike Marshall set a record for games pitched with 106 and won the Cy Young award while pitching for the Dodgers. Jeff Burroughs led the AL in RBIs with 118 (while also batting .301). But his Rangers did not win their division. Only one other player, Bando, had 100+ RBIs in the AL (he had 103). "Lou Brock, who finished second to Steve Garvey in the National League MVP voting, says he wouldn't accept the MVP next year if he stole a thousand bases. Brock, who had his best year ever, expected to get the award and even set-up a press conference. Brock beat Maury Wills' 12-year old record of 104 steals." I found a NY Times article through my school's library that confirms the 1000 base quote and this is how I recall it. Brock also said the voters used "bad judgement" and his manager, Schoendienst, agreed.